We offer the very best in Waxing. Quality film waxing for the sensitive areas of the face, underarms and bikini and bronze strip waxing for the larger areas. Monoi of Tahiti Extra Film Wax – our “Rolls Royce” choice from the Depileve range is a revolutionary concept in its formulation. Perfect for sensitive areas, armpit, bikini line, zones of difficult access and face, our choice of wax is also especially good on all types of hair, especially effective on short and difficult hair, yet very gentle on the skin. 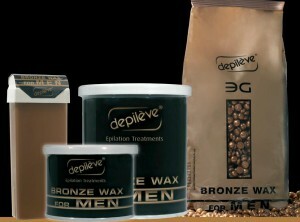 We also offer the newest addition in the Depileve range, “Bronze” Film Wax for men. This new disposable wax pulls out even the most stubborn hairs. Moreover, with the addition of Salicylic Acid, it prevents the appearance of ingrown hairs. The formula enriched with Ginseng oil protects the skin thanks to its revitalizing and repairing action. Our waxing is carried out by professionally trained therapists so as to ensure your experience is not only as pain free as waxing may possibly be, but that you are truly satisfied with the result. 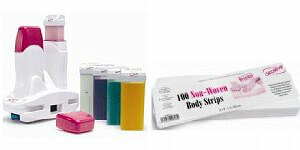 Our Depileve roll on strip waxing system used for larger areas, ensures we once again offer you only the very best in waxing. Do you have problems with in-grown hairs? Does your skin irritate easily after waxing or shaving with red bumps? Do you know men or women who suffer from razor bumps or razor burns? Folisan is the solution to these problems. Please ask one of our therapists to give you more information on this amazing product. The waxing price list for the following areas is available on request through our contact page.